The name Tirkslieve is known from the Ordnance Survey Name Book. The peak is unnamed on the Discovery map. Tirkslieve is the 940th highest place in Ireland. 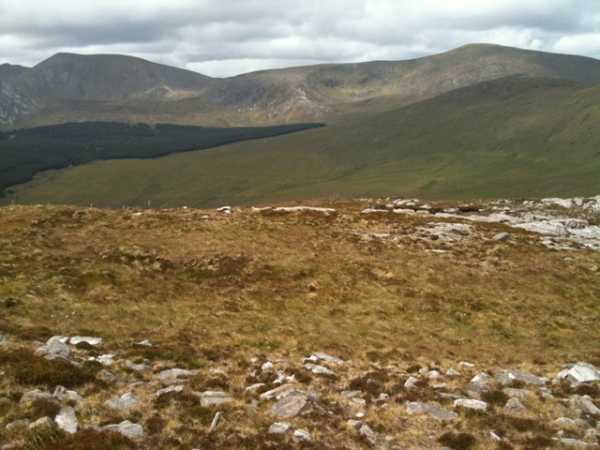 The Nephin Begs are a fine group of mountains that are relatively unspoiled by human activity. Several of the smaller hills in the range have never received any comments at all on MountainViews, despite their being easily accessible by road. This reflects how little visited these mountains are. Tirkslieve is an example of this – it is next to a road but has only been climbed by 6 members of MountainViews, and has attracted no comments at all up to now. Tirkslieve is situated on the eastern side of The Glennamong River Valley, which lies above Lough Feeagh. It could be the first (or last) summit in a full horseshoe circuit of the valley. From Newport I took the N59 Mallaranny/Achill road and after 1km joined the minor road heading north towards Lough Feeagh. I reached F963 028 A (Map 31). There is a Coillte access track running from here around the southern slope of Tirkslieve into the Glennamong River valley. This is suitable for cars as long as you drive slowly over the odd pothole. There is a post-and-wire gate on the track that is easily opened. Be sure to close it after you as it helps control sheep and cattle. The track soon reaches the ford that is marked on the map at F948 024 B. There is now a modern concrete bridge here, no doubt to carry heavy Coillte machinery. The access track continues into the forestry, allowing vehicle access further than implied by the simple track shown on the map. This allowed me to park at F944 030 C in a lay-by. I walked another 100 metres north on the track to reach an area of cleared forestry. I turned right (east) and picked my way 100 metres over rough deforested ground to reach the Glennamong River. Tirkslieve rises on the other side of the river, but first I had to follow the river a few hundred metres north to find a safe crossing point. I’d recommend crossing the river at the concrete bridge mentioned earlier.